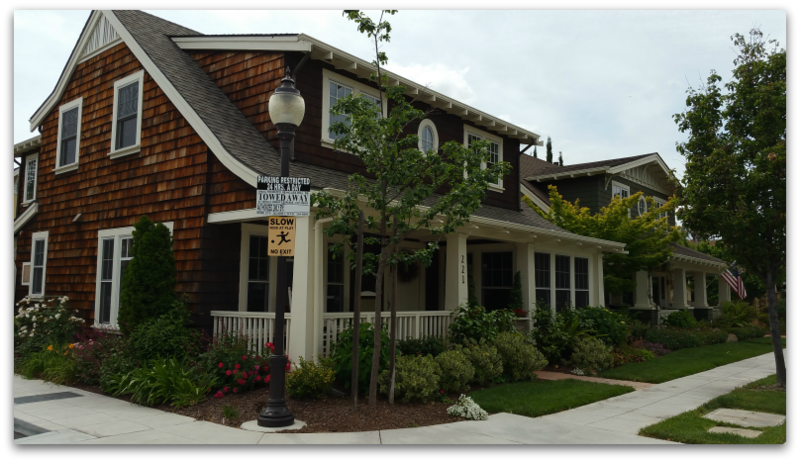 Creekside Village is one of the youngest subdivisions in Los Gatos, and it’s located in a prime “walk to town” neighborhood with the highly prized Los Gatos schools, too. As the name implies, this community of houses sits alongside the scenic Los Gatos Creek (the Los Gatos Creek Trail is on the far side of the water from these properties). All of these factors make the Creekside Village neighborhood a very attractive option for house hunters. This subdivision was built by Barry Swenson with prefab or manufactured housing between 2005 and 2006 on the former site of a mobile home park. There are 60 homes, ranging in size from 1251 square feet to 1747 SF (average home size is 1503 SF). Lots are mostly smaller, ranging from 1845 to 8909 SF, with the average parcel being 2846. Garages are either single car or 2 car tandem. While the houses are not big, the interiors are beautifully appointed and there’s nothing modest feeling about them in that regard. All homes are on Creekside Village Drive and are assigned the 95032 zip code. It’s a very tidy community and includes a home owner’s association for the shared amenities such as the clubhouse, pool, workout room, private road, and parking. There are pros and cons to every neighborhood. 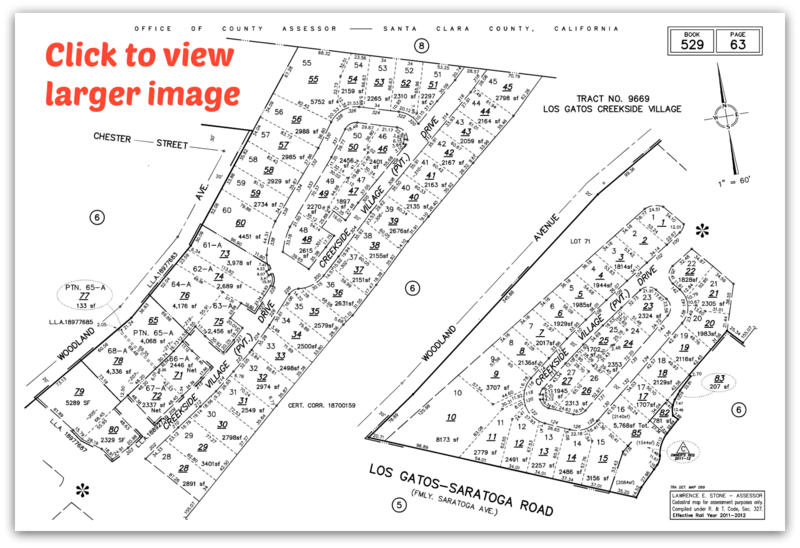 In the case of Creekside Village neighborhood, the negatives are that it’s situated very close to Highway 17 and also Highway 9 (Los Gatos-Saratoga Road). Some home buyers may not like that the lots are narrow, mostly forcing single car garages, with houses quite close together. What do homes in Creekside Village cost? Those sold over the last year (as of the writing of this article, October 2016) have sold at $1,199,000 and $1,429,000. That’s right, only two sold in the last year, so it’s clear that inventory doesn’t come up often in this area. For downtown Los Gatos, this is bargain real estate pricing! 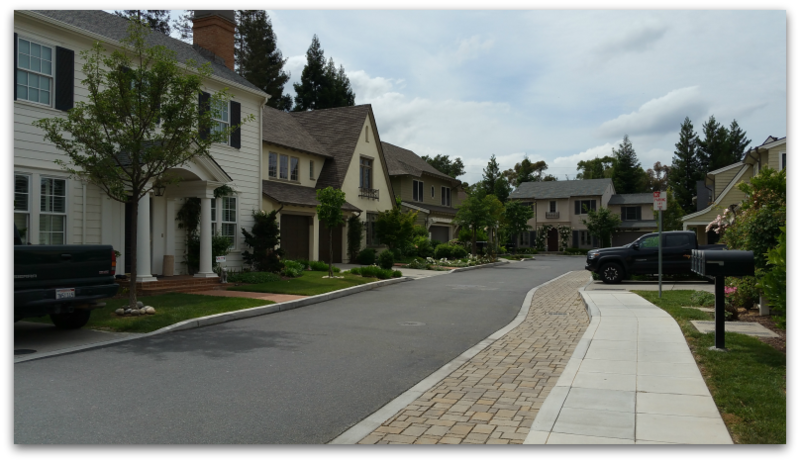 Looking for a neighborhood full of spacious, younger homes in a close-in Los Gatos location? Bluebird Lane should be on your list of areas to check out: if you’re lucky, one of the traditionally styled homes may even be for sale. 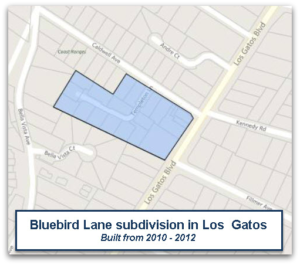 Built by Robson Homes between 2010 and 2012, the Bluebird Lane neighborhood is situated just off Los Gatos Boulevard near Los Gatos-Saratoga Road. It’s under a mile to the highly regarded Los Gatos schools, and only a tad more to get to downtown – an easy bike ride or stroll by foot. What are the homes like at Bluebird? Think two story, traditional style with Colonial, Cape Cod, Craftsman and similar architectural themes. There are 19 homes in the tract. One was the original, grand estate house (more on that below). Two are small with 1300-1400 SF and attached (“duet homes”), and these were designed to be more affordable. The rest are detached and much larger, with 2,960 to 3,935 square feet. The 17 larger homes feature 4-5 bedrooms, up to 5.5 baths, and some include basements and finished attics. Most of the homes are on fairly small lots of between 4500 SF and about 6000 SF. Even the main road, Templeton Lane, is narrow. This is probably the only negative: the backyards are small and the homes feel awfully close together for the size of the buildings. Inside, the homes feature open floor plans in the living areas, spacious and well appointed kitchen, quality fixtures and touches throughout. If you appreciate elegance, you’ll love these well designed, quality homes.